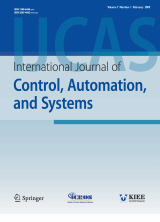 Abstract : "In this paper, under the complex-weighted directed communication topology, the problem of distributed fault tolerant control (FTC) for a class of second-order multi-agent systems (MAS) in the presence of actuator faults is studied. The faults can simultaneously occur in more than one agent. First, a real representation of the secondorder dynamic agent with the complex weighted graph is proposed. Second, based on the proposed representation, distributed finite-time convergent observer is proposed for each agent to estimate the state and fault in a finite time. Then, using the fault information obtained online, an adaptive FTC protocol is proposed to compensate for the failure effects and to enable all the agents to achieve the control goal. Also, we show that the closed-loop system can be guaranteed to be asymptotically stable in the presence of faults. Finally, an illustration example is given to demonstrate the effectiveness of the proposed scheme." Keyword : Actuator fault, complex Laplacian, fault tolerant control (FTC), multi-agent systems (MAS).